After the Reading and Southampton game the previous evening, it appeared that WHU’s chances of automatic promotion were slim if not gone completely. With this in mind, the fact that we had a near full house surprised me. Over 32000 came to watch a game between two now playoff hopefuls. Once again the cold set in, and i expected yet another draw for Big Sams team. It was refreshing to see that Vaz Te was allowed to play up front with CC, in a near 442 formation. Also coming in for a second time in just over a week, was Guy Demel, making a welcome run in the team post injury. The two up front strategy seemed to work as we hit the bar in the first minute. Then out of nowhere Vaz Te banged one in from range, leaving the keeper like a Coldstream guard, one nil 3 mins. By seven mins he had doubled his tally with a header for 2 nil. Brighton had no response and by 10 mins Nolan had got onto the end of a Tomkins back post header to tap in the 3rd. By this time Hamers fans were dreaming of record wins, and closing the goal difference on Southampton. And then BFS switched to one up front again, and Vaz was restricted to shots from distance which i assume was team orders as Brezovan, the seagulls keeper, didn’t like to catch and kept punching out, giving forwards who follow up some sort of chance. Half time came and went, pretty quietly, as did the first 20 mins of the second half. The we moved to two up front again, and Vaz Te took a stunning bicycle kick to get his hattrick, and celebrate his change (not BFS’s in my opinion) to go back up front. This reopened the floodgates, and CC got his first of the day with a hard shot that deflected off Lansbury to go 5 nil up. CC by the way had his worst day bar none, missing nearly all balls hit his way, but he didn’t give up and got his reward. Just when things couldn’t get any worse for Brighton, in came a Noble corner, which hit the back of the calf of Dicker for an own goal, and the last of the day. West Ham win 6 0, but it’s all a little late, we need Southampton to lose at least one of their next 2 games. We have to win all of our games, and it really didn’t need to be this way. Once again, 2 up top is the solution, and Sam should be by now getting disciplinaries from the board based on this omission. Even today it proved the difference for probably two more goals. Speaking of which Lansbury should of got one, when he blazed over the bar from about 8 foot. This was a player who i thought would make the difference, and always scores for the under 21’s, but looks terrible for WHU. Where does he need to play, Centre Mid ? Would you drop Noble, or introduce some sort of xmas tree formation? Apparently Morrison in injured. Or apparently Ravel has had a tiff with our own Kevin Nolan, and is currently on suspension from the club. This of course could be nonsense, but not surprising. One other thing i heard is that if we dont get promotion, then Kevin Davies is on his way this summer. Really ? To replace who, Carew? Baldock ? or someone else who hardly plays. We have Bristol City on Tuesday, in a game to extend our away record and close the gap on Southampton. We drew at home, in a dire wet evening game, lets hope Tuesday is better. Then Leicester away on Saturday. By then, realistically we will know where we are in relation to a straight promotion. Fingers crossed and 2 up top. 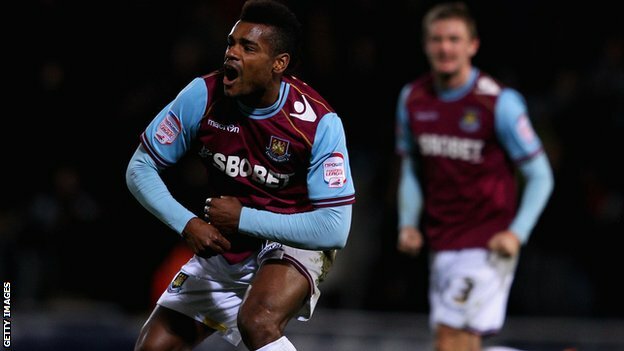 MOTM: Ricardo Vaz Te. who else. Is this the night Sam lost the Boleyn ? Now onto the meat and veg. We were poor, and played the old one up front game again. How many times do I have to say this Sam, Carlton Cole cannot play every ball up in the air. The guy is good on the ground and can bring others into play, but you continue to choose to use him as a traditional target man. David Cross left some time ago. Noble and Nolan were inefficient, and Noble looked like he had been on a treadmill all day, he was that slow. Tompkins has to come out of the midfield, you are destroying a lad who could be a United legend, and if we don’t go up, will definitely leave at the end of the season. Greenie was getting v.frustrated with the teams lethargy, and this has to stop. If you have a plan, stick to it, else change the plan. Maynard was completely wasted on the wing. This is not his fault. Yet another who must be wondering why he is there. Then we come to the tactics. Once we went one nil up (to a lucky goal, but we had had all the pressure to be fair), why did CC and Maynard have to leave the pitch immediately ? Did you not think they may go on to score another, as Boro would have to open up. Collison has been poor all season. This was the time to introduce Morrison, to inject some pace and vision into proceedings. Once they equalised (great goal by the way), you almost admitted this by bringing on Baldock. Sam , you are losing the home crowd. We don’t expect to be winning leagues all over the place, and knocking out Barca in the CL, but we do expect common sense. You have done well thus far, but you have to play to our strengths, as well as the weaknesses of the opposition. I’m sure you heard the Paulo Di Canio calls , the same as I did. If backed by the board i think you can do a job for us in the Premiership, but currently the main objective is the Championship. A win on Saturday is a must. Stand firm, keep the faith ! Yet another freezing cold evening took mrben09 to the fortress of Upton Park, for a semi local derby with Watford. A team that used to have such luminaries as John Barnes, Luther Blissett, and Elton John, are now a confirmed championship side, but should of provided no competition to a Hammers team that so convincingly beat Cardiff the previous Sunday. Collinson and Vaz Te were dropped from the starting line up for Matt Taylor and Julien Faubert, a move that i saw as positive and that nearly reaped rewards, as MT hit the bar after about 50 seconds from a 35 yrd shot. I’m afraid after that we huffed and puffed, and apart from a sitter missed (a recuring theme this season, Sam, get these guys practicing ) from Faubert following a MT cross, we stumbled towards half time. The front line appeared to be not engaging with the rest of the team, apart from flashes of co-ordination from CC. The second half proved a different proposition with WHU pummelling the Watford penalty box but with no end result. I say penalty box, as shots were thin on the ground. With about 20 to go, i pointed out to Angry John, that Watford seemed to be getting on top. At that very minute, Watford scored a goal out of nothing, with a long range grasscutter, hitting the inside of the post and its one nil Watford. Then it became charge of the light brigade stuff, with long balls to CC, and follow ons. To be fair CC played really well for all of the second half, winning about 80% of balls in the air, and laying off well. With about 8 to go of nomal time, Vaz Te managed to get on the end of a cleared corner to shoot through several players and equalise. Good news, but still we ploughed on. Due to a serious injury to a Watford player early in the secong half, there was 12 mins of extra time. More bluster from WHU, but no goals. So in short, a disappointment for WHU fans, but a point at at the end of the day, that we needed to dig out. This is good practice for next year (assuming promotion). MOTM James Tomkins, who pretty much collected everything aimed near him all night, and made some crucial interceptions, and appears to be learning well from Faye. Valentines day. A day for lovers and couples to enjoy each others company, safe in the knowledge that they have their entire lives ahead of them, in cojoined bliss. Or a day to watch the top two gladiators in the championship, battle out for league title honours. Thanks to Mrs mrben, i “chose” the latter, and expected a game worthy of the premiership, where both teams should be plying their trade next season. What i got was a premiership ref, who didn’t know his backside from his elbow and nearly ruined what should of been the star advert for the second tier of English football. The now obligatory weather report was that although slightly warmer, things were still chilly in the upper Bobby. However out on the pitch things were heating up nicely, with Vaz Te nearly getting on the scoresheet after 1 minute. Matt Taylor was brought in to replace the suspended Nolan, and looked quite effective on the wing. Taking aside the fact that Southampton seem to enjoy time wasting by holding the ball with the keeper only to short pass to a defender, we were easily on top. After 22 mins or thereabouts, the stand in captain, Mark Noble, turned in the box and was tripped for a stonewall pen. In some minor kurfuffle post the penalty award, a Southampton player hit the deck in theatrical style, which ended up with Matt Taylor being red carded. Now, i didn’t see this fully (Mr Wenger ! ), and if he hit them then fair do’s, BUT, the linesman flagged the pen and overruled the ref, who was unsighted. The same linesman had this “assault” unfold in front of him, and did nothing, and the ref was still some distance (with several people in the way) away. The ref did not consider speaking the the lino, and the lino said nothing either. You either assist or don’t, you cant just dip in when you feel like it ! The ref then preceded to call every West Ham tackle a foul, and even blew for a foul throw (think of the last time you saw a ref blow for one of these in a TV game…………….exactly !). This culminated in the ref waving away, what i can only call an assault on CC, from the goalkeeper. He came out, got nowhere near the ball, jumped into CC, and laid him out (all 6.4 and 15 stone of him) flat. Not even a free kick, let alone a red card. Disgrace. Green made a point blank save (after a mishandle) from Billy Sharp just before half time to keep it one nil Hammers going into the break. The second half was all Southampton, as WHU defended deeper and deeper. Same as the wall game. The inevitable came with 15 to go, as Southampton scrambled an equalizer with an outstretched leg poking home the goal. Nicky Maynard came on for a knackered CC, and nearly got the winner from an acute angle and looks a useful addition to the squad. All in all, a good result bearing in mind the numbers game on the pitch. 2 players stood out again, Noble and Reid. Reid was extra solid, as his usual sparring partner Tompkins was playing in the midfield, and Noble ran himself into the ground again. After missing last week’s comeback against Derby, i arrived at Upton Park hoping for a another impressive hammers display. This season i have missed the great home wins against Pompey, Derby, and Blackpool, but have witnessed the games against Leeds, Cardiff and Bristol City. This is starting to form a pattern, and one that i would of liked to rid myself of yesterday. May i add that yesterday the Upper Bobby was exceptionally cold and windy, or maybe i’m just getting to that age ! After the now obligitory 1 minute for Gary Speed (let us not forget one of the greatest midfielders of all time – Socrates, passed away this weekend. RIP), the game got under way and WHU came out of the blocks, winning plenty of possession and corners. Although industrious, i have mentioned in the blog previously that CC, cannot play on his own up top, and this was once again proved. Although, the midfield were supporting quicker than usual, especially Collinson, who overall had one of his best games this season (and was actually played in position – coincedence ?). Nolan missed an open goal ,after some great work from CC to get the ball across the box. Maybe the ball could of been slightly better, but Kev should of buried it. So, half time finds us at 0 0, but the Hammers were more than in control. Early in the second half, CC flicked on a ball, that Nolan read perfectly, and then lobbed the keeper from distance to open the scoring. From then on it looked a formality. Until someone on the Burnley bench pointed out that we dont defend corners or crosses very well. Within 5 mins McCann had equalised heading in a cross, and then on the 75th minute, substitute Vokes took his chance, and headed in the winner from a corner. How we threw it all away. In all, it was a bad day at the office, and thats all. We should of won, with Jack and CC both hitting the post. Another day we could of had a rout, but all credit to Burnley for their attitude and not giving up. I assumed that without Eagles they wouldn’t move it around as well, but i was wrong. Some final comments. Jack played really well and i hope BFS keeps him in a position that suits him rather than suits the side. Nolan looked lively for a change, and with this being the 3rd game in seven days, maybe is approaching some level of fitness. CC needs help up front, and this is easily sorted while Baldock is out, by using either Nolan or Collinson in a real no. 10 position. Now defending. Faye and Tompkins look fantastic in one to one situations (Faye to me looks as good as Bilic and Martin, from back in the day), but there is some misorganisation in the way they defend crosses and corners. BFS, who is a diligent student of tactics, needs to sort this out, as that is one of the reasons we went down last year. Lets get the show back on the road next week, against Reading. I’ll take a well defended one nil. On a slightly different note, I happen to mention to my wife that all the cool kids are going for romantic breaks to the Ukraine this summer. I don’t think she believes me ! A month spent across the pond for me has found the Hammers moving into second in the championship, behind the force of nature that seems to be Southampton at the moment. An unnaturally warm end to October brings the managerless and big spending foxes up UP. Bearing in mind our pretty poor home record this season (and most others recently ! ), and the fact how teams raise their game when the chips are down, I had a draw in my head. The noisy foxes were silenced after 17 mins, when Sam Baldock belied his height to get up at the back stick, and onto the end of a Carew cross for our first. This was quickly followed by Julien Faubert hitting a good 20 harder into Schmeichel the youngest bottom corner for our second. Faubert seems to be enjoying his new position and seems to be doing well at it, long may this continue. We reach half time comfortably in the lead. Happy days, its beer time. We then enter the usual WHU trait on failing to protect or build on a lead, and let Leicester back in via Andy King. Carew is then subbed for big Fred and the draw looms as the most likely outcome. To be fair on a rare attack at this stage, a route one play finds Fred flicking on for Sam to put away a calm finish, to go 3-1 up, and surely get the 3 points. Andy King then scores a screamer to make it 3-2 and then we press the ? button and bring on little Freddie Sears. Now, maybe I’m wrong but I just don’t get it. He wasn’t good enough under Zola playing football, and definitely ain’t good enough under big Sam’s longer ball regime, so why does he persist, when Nouble is playing well for the gills and is more built for the job. Sorry Fred, I know you are WHU through and through but you just don’t cut it kid. Anyway we crack on and ground out a hard won win from what should of been an easy job at half time. We are now pulling away from the play off places and another 3 points on Tuesday against Bristol City should compound this position. I am hoping to see Carlton Cole at least on the bench. He is our top scorer this season along with Sam Baldock and the two of them need more time together to get a long lasting partnership going.